The following recipe was submitted by Eliana Murphy. Thank you Eliana! Sift powdered sugar, milk powder and salt and reserve in a medium mixing bowl. Remove pan from heat, and gradually add powdered sugar mixture to pan, incorporating with spatula. Make sure that mixture is completely integrated. Let mixture cool until slightly warm to the touch. Be careful that little ones do not burn themselves by molding the candy before it has cooled! 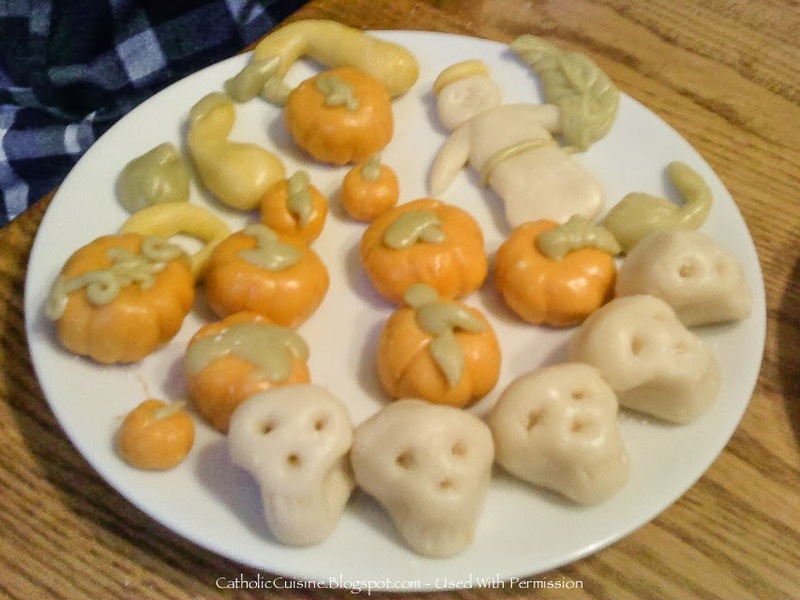 It is recommended to not have children working with boiling candy, but they can safely participate in the measuring, kneading, and molding stages. At this point, if you wish to create only candy corn shapes, you can link back to the original recipe. We got very creative with our candy and created a variety of shapes related to All Hallow's Eve and All Soul's Day. Knead food coloring into candy as desired before shaping. If the candy is too squishy or sticky, especially once you add the food coloring, try adding a little extra powdered sugar to the mixture. If you wish to avoid staining your hands, knead inside of a plastic bag or use plastic wrap between your hands and the candy. Once the candy is colored, you can mold into shapes on a surface covered with wax paper, so it won't stick. After the candy is shaped, if you wish to keep it for a longer time (if it is not all eaten up immediately! ), store at room temperature in airtight container, separating layers with parchment or waxed paper. 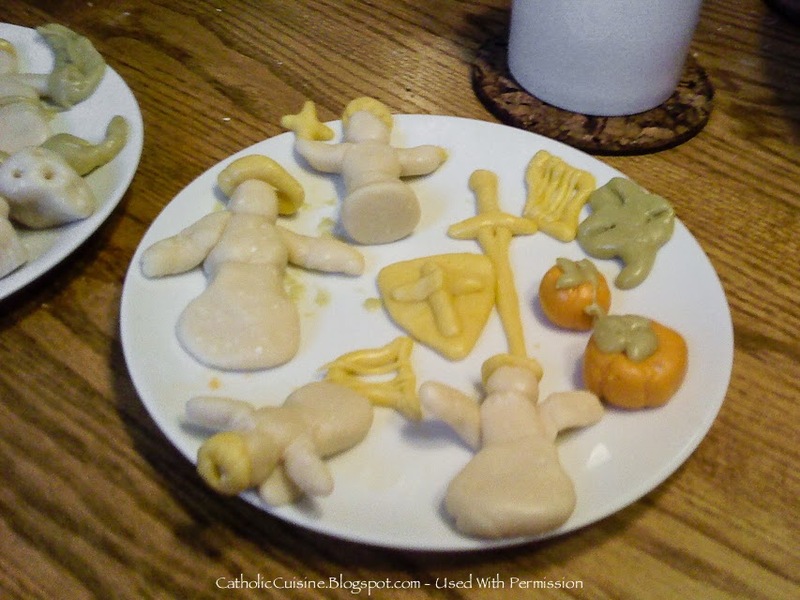 Shapes we made include saints, pumpkins and squash, skulls for All Souls, a harp for St. Cecilia, a shamrock for St. Patrick, and a sword and shield for St. Michael. This candy could also be used to make shapes for Christmas, Easter, St. Valentines Day, or any other feast day! What a great idea, they really turned out well! Great idea - they are so cute!